I love Sweet potatoes! And always loved eating it as such. There are always certain things that you just eat as such and never can imagine it being incorporated in a dish right. Sweet Potatoes are such things for me. Shakarkand as it is called in Hindi, we call it Genusa gadda in Telugu. 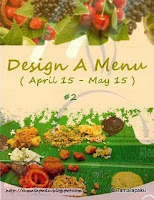 This month when Harini announced her Design a Menu Event, I checked in to see what ingredients she listed. When I saw Sweet Potato as one of the mandatory ingredient, I knew I ought to make these parathas. The first time I remember reading this paratha being made with Sweet Potato, was when I started blogging. Since then I have seen sweet pototo being used in different ways. But paratha is the best way to use it. I remember Richa posting this and checked to see how she made it. Though I don't normally add hing to my parathas, I saw it was used and wanted to experiment with it. It gave a nice taste and since I can never make without adding jeera powder, I added that too to the dough. 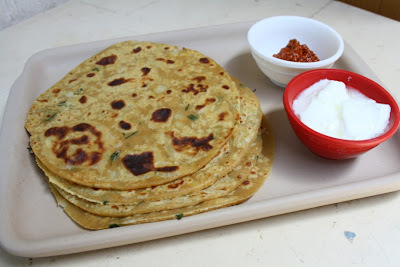 I always make parathas two ways, one stuffed way and the other blended with the flour. When you blend the stuffing mix to the flour you can end up making the parathas much quicker than the regular stuffed way. 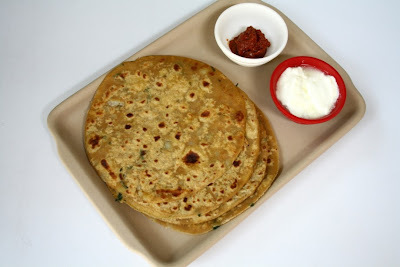 We had these for our breakfast this morning with just Curds and Avakkai and can tell you that it was simply too good. Pressure Cook the sweet potatoes and peel once it cools down. In a bowl, take the wheat flour, spices, salt, curds, coriander leaves and mashed sweet potatoes. Mix well to incorporate the spices in to the flour. Add water as required to knead into a soft and smooth dough. Keep aside for 10 mins. Heat a griddle/tava. Roll into medium sized parathas and cook like a regular paratha, spreading a few drops of oil on both the sides while cooking them. Serve with Curds and pickle of your choice. 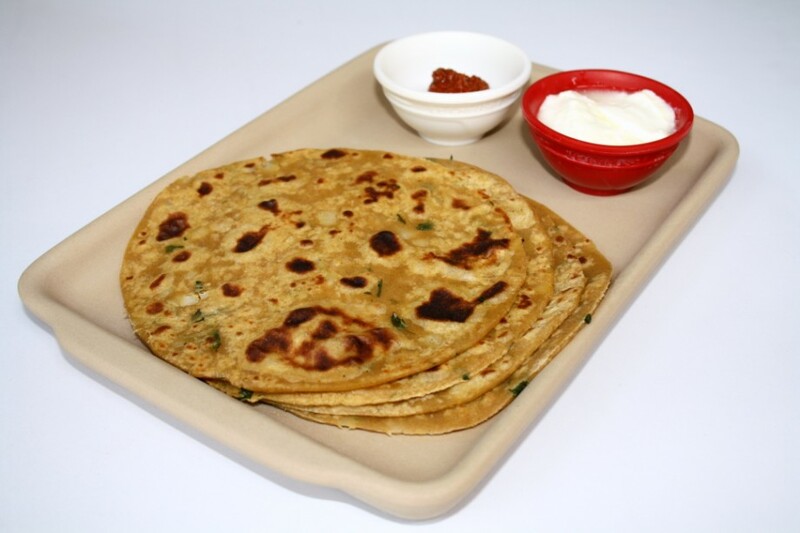 These parathas tend to be very soft because of the potatoes and make a great start to the day. 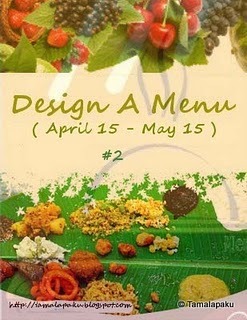 Sending this to Harini for her Design a Menu Event. Menthakku Pappu , Godumai Halwa ~ Wheat Halwa, Chocolate dipped Strawberry. This is also going for my Breakfast Mela, which is going on until May 20th.